Web team members at meeting. 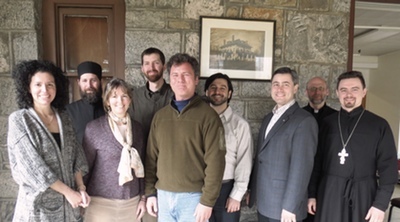 [YONKERS, NY] – The Assembly of Bishops convened a meeting to share ideas and discuss collaboration between the Assembly’s communications team and the internet staff of member jurisdictions. The meeting was held on the campus of St Vladimir’s Seminary in Crestwood, NY on March 6 and brought together representatives from the Assembly’s Secretariat, the Greek Orthodox Archdiocese, the Antiochian Orthodox Christian Archdiocese, the Orthodox Church in America, the Ukrainian Orthodox Church, and the American Carpatho-Russian Orthodox Diocese. All of the Assembly’s member jurisdictions were invited to attend. A main topic of discussion was how the Assembly’s website can be enhanced to include Orthodox news and resources on the Orthodox faith. 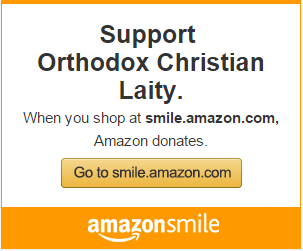 The group agreed that the Assembly’s website and the jurisdictions’ websites can support each other in reaching the Orthodox faithful. 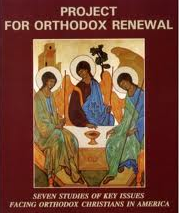 The group touched on other relevant topics including sharing parish information so that the Assembly’s parish directory remains up-to-date; the creation of a clergy directory; the importance of providing the faithful with resources on internet safety for youth and adults; and mechanisms by which Orthodox news and information can be disseminated directly to parishes. The group will meet periodically by phone to continue vital conversations related to information, technology, and faith. Attendees included: Ryan Platte, Technical Manager of the Orthodox Church in America’s web site oca.org; Monk Benedict [Armitage] and Douglas Cramer [Antiochian Orthodox Christian Archdiocese of North America], Priest Ivan Synevskyy [Ukrainian Orthodox Church of the USA]; Priest Peter Paproski [Carpatho-Russian Orthodox Diocese]; Jamil Samara and Theo Nicolakis [Greek Orthodox Archdiocese of America]; Ginny Nieuwsma [Saint Vladimir’s Seminary and Antiochian Archdiocese], and Chrysanthe Loizos [Assembly staff].